New Delhi: All India Ulama & Mashaikh Board is concerned about the spread of ‘Wahabi extremism’ and radicalisation of Muslim youths in India. The group of Sunni Sufi Muslims is holding a conference on 16th October in Moradabad with an aim to spread the message of peaceful co-existence to check the growth of hardline ideology in the country. “Wahabi extremism is sweeping across the sub-continent. And after Afghanistan and Pakistan, the radical Wahabi Ideology is aggressively engaged in the radicalization of a few Indian Muslims. 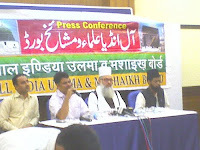 Said Syed Babar Ashraf, National Secretary, All India Ulama & Mashaikh Board in a press conference on Thursday in New Delhi. He also said that his group is organising a nation-wide campaign to spread the message of peaceful co-existence, in an attempt to check the growth of hardline ideology in the country. He said poverty and unemployment is pushing youths to radicalism. “Increasing unemployment and rising poverty among Indian Muslims provides a fertile ground for breeding of this ideology. Ashraf said, adding that it is the “need of the hour to stand up and raise the voice against this menace which poses a big threat to entire humanity as well as the internal security of our Nation”. Named as Muslim Maha Panchayat, Moradabad conference will also discuss issues and problems confronting the Muslim community in the country. 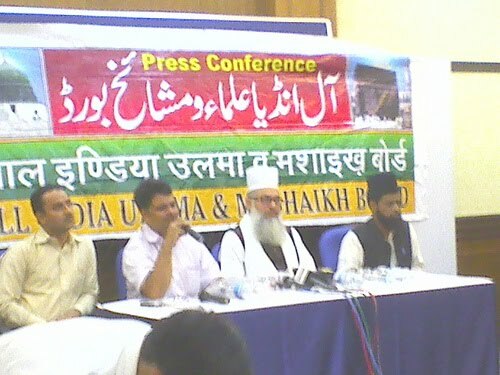 Major issues to be taken up are: Transparency in appointment of members to various Central and State bodies and induction of Sufi Sunni Muslims in such bodies; Reservation for backward Muslims (as per the recommendations of Justice Ranganath Mishra Report) and Central Madarsa Board Bill (with amendments proposed by the Ulama and Mashaikh Board). He said that Sajjadanashins or caretakers of most significant Sufi Khanquahs in India – Ajmer Shareef, Dargah Hazrat Nizamuddin Auliya, Kicchauchha Shareef, Marahra Shareef, Bareilly Shareef, Pandva Shareef (West Bengal) have come together under one umbrella body - The All India Ulema and Mashaik Board - to redefine the agenda for Indian Muslims. The Muslim 'Maha Panchayat' is scheduled to be held on 16th October 2011 from 9 am onwards at New Moradabad Colony, Zero Point, Pakbara, Delhi Road, Moradabad (Uttar Pradesh).